When I was researching my Deco España: Graphic Design Between the Wars (Chronicle Books) in 1997, I was surprised to find a rich mine of Spanish design that Philip Meggs and Richard Hollis had not included in their historical surveys. But, if we in the US and Britain were ignoring such splendid, if not innovative, artist / designers as Coronado, Masberger, Alonso, Camiro, Capara, Morell, Giralt Miracle and the masterful Josep Renau, Spanish design historians were actively chronicling their past and present. 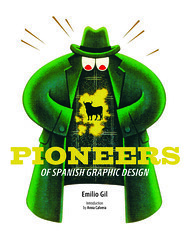 Notable among them were Enric Satué, whose Los años del diseño and El diseño gráfico en España are key texts, and Emilio Gil, founder of Tau Diseño and curator of ‘100 Years of Graphic Design’ at Madrid’s Reina Sofia museum in 2000, who is the author of this new book, which surveys the period between 1939 and 1974. While this time span seems somewhat arbitrary (1935-75, the period of Franco’s dictatorship, might have made more sense), it covers the practice of fifteen designers that are little known outside of Spain. The roster includes Josep Artigas, Alexandre Cirici Pellicer, Amand Domenech, Elias & Santamarina, Jordi Fornas, Fermín Garbayo, Daniel Gil, Ricard Giralt Miracle, Ernest Moradell, Antoni Morillas, Joan Pedragosa, Josep Pla-Narbona, Manolo Prieto, Julian Santamarina and Tomás Vellvé. All are pioneers in various media, from posters to album covers (and there are plenty of them) and book jackets (even more of them), to logos and packaging. Garbayo’s expressionistic bullfighting posters, Domenech’s American-style advertising art and Pedragosa’s Dada-like collages from the mid-1960s show the eclecticism in Spanish design. Some of the work is derivative of styles in France, Germany, Italy and even the United States of the period – Pla-Narbona’s designs are a cross between Loupot and Rand – but other examples express a distinct national and regional graphic character. I was particularly taken by Prieto’s covers for Novelas y Cuentos, a collection of books in magazine format (1942-56), which look strikingly contemporary. To ignore these designers in our basic literature is to show a profound lack of documentary rigour. 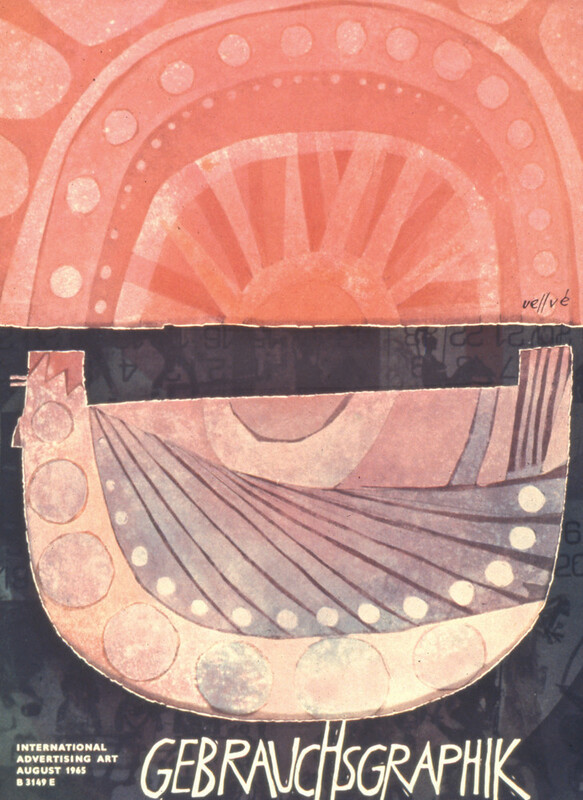 Each section of the book focuses on an individual designer’s visual legacy. Though a lovely object, it presents a rather cluttered collection of disparate images. There is always a danger when claiming designers for ‘pioneer’ status to show too much of their oeuvre to support the point. I admit I enjoyed looking at this critical mass but there are jarring contrasts. While the result is not untidy, Gil was clearly unsure whether to be demonstrative (there are too many pull quotes) or catalogue-ish. That quibble aside, exposure to this material demonstrates how unfairly our major history books, including the latest crop, have examined twentieth-century Spanish design. Wraparound poster-jacket collages design by Josep Artigas (Polil poster, ca. 1948) and Manolo Prieto’s iconic Osborne Bull silhouette, 1956. Top: Tomás Vellvé’s 1965 magazine cover for Gebrauchsgraphik.